Other than just hanging out and enjoying the view of the emerald green water, visitors can enjoy the giant inflatable slide, water trampoline, or the inflatable obstacle course called Crab Island Waterpark. Take a swim over to the many floating food vendors and grab a bite to eat while listening to local bands playing on the floating stage. Crab Island is fun for everyone! 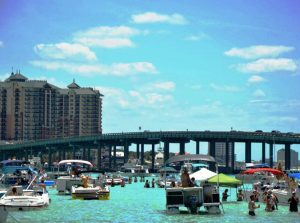 Although it may sound like one giant party scene, Crab Island is a vacation destination for all ages. If you have small children and are worried about the atmosphere, just anchor your boat away from the rowdy groups that tend to stay closer to the floating stage. 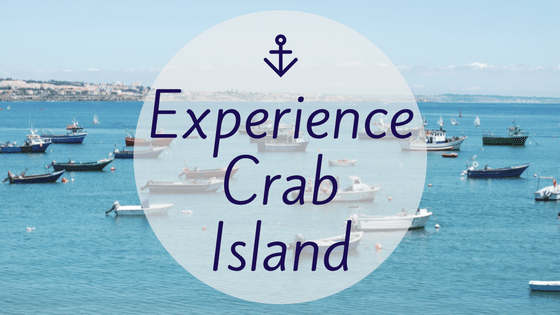 There’s no bad time to visit Crab Island, but different times of the year tend to attract different crowds. If you’re looking for a party you might want to plan your trip during the weekend during the summer. If you want a more calm and relaxing time then consider going during the week. Whenever you go, you’re bound to have a great time.